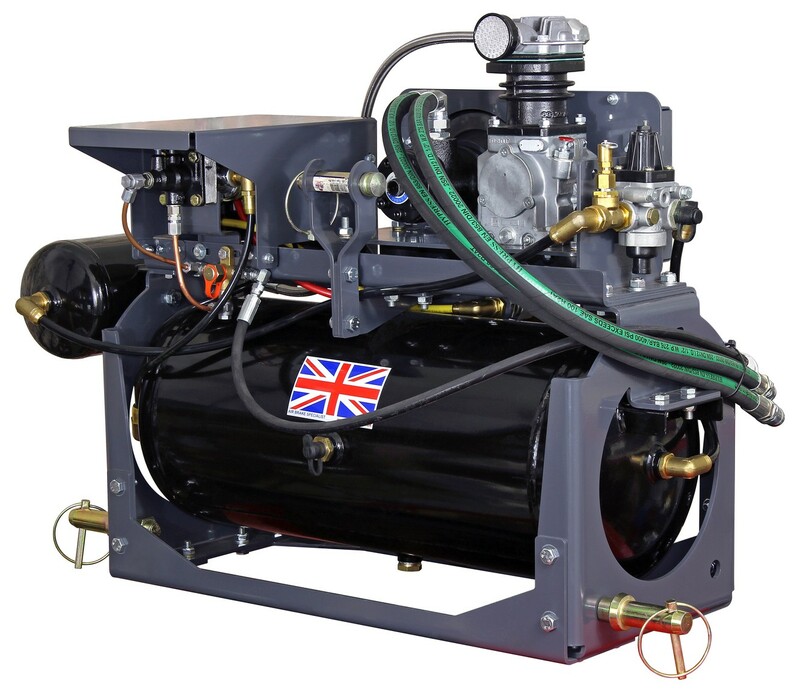 Consists of a twin-cylinder air compressor, belt-driven by a hydraulic motor and mounted on a 6mm steel platform with anti-vibration rubber mountings under each corner. 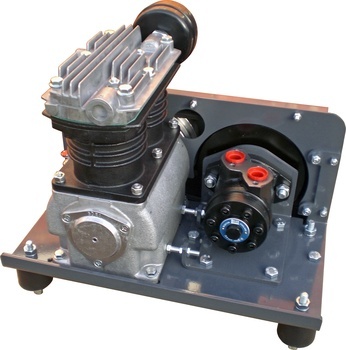 Suitable for on-site use in agriculture, forestry, railway maintenance, industry, or wherever the unit can be powered by a hydraulic pump. The EHC004 compressor unit can be used to power the equipment used on rail maintenance vehicles eg. Poclain, Liebherr. Other uses include fence post air drivers used in forestry and farming, air nail guns for fencing, various power tools, tyre inflating equipment, air-driven pressure washers etc. 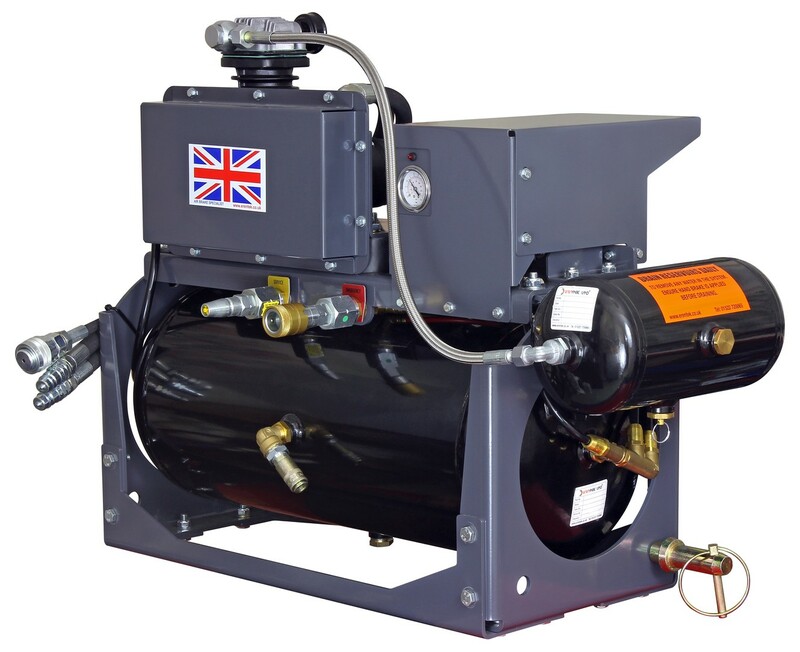 When tested, the compressor filled a 50-litre air reservoir from zero to a pressure of 8-bar (116 psi) in 70 seconds at a hydraulic flow of 40 litres/min. A further test at 35 litres/min filled the reservoir to the same pressure in 105 seconds. Both tests were carried out when the oil was at normal working temperature. The air compressor speed of rotation is exactly twice that of the hydraulic motor due to the belt pulley sizes chosen for this unit. For example, a motor speed of 800 rpm would result in a compressor crankshaft speed of 1600 rpm. Click here for more compressor information, including output figures and power consumption. 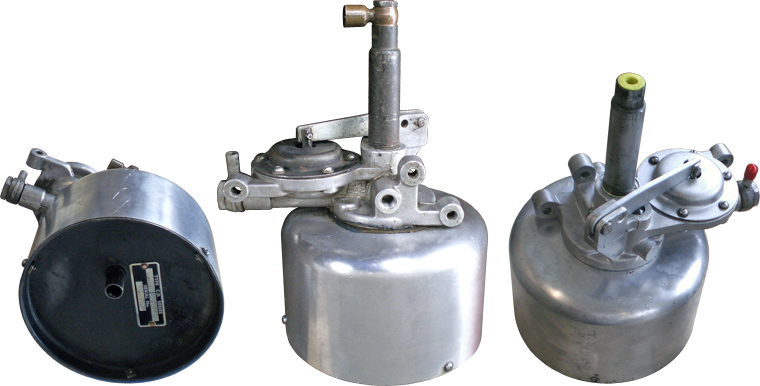 We can now offer a repair service for the Clayton Dewandre vacuum servos fitted to certain motor cars built in the 1950's including Armstrong-Siddeley, Jaguar, Land-Rover, Riley and Rover. The servo part numbers are GA 15002 and GA 15022. 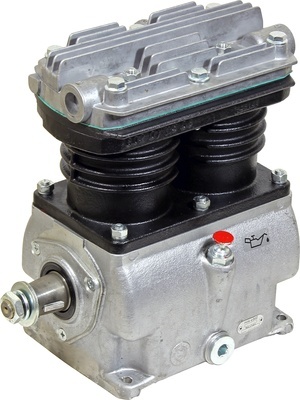 The cost of repair will inevitably depend upon the condition of the servo; many of these units are now suffering from corrosion and will also need attention to leather seals and other parts. If you have one of these servos that needs repairing please contact us and we will be able to give you more information. 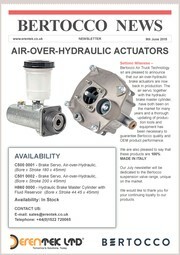 News from our main supplier of air brake and air suspension parts, Bertocco Air Truck Technology srl., Milan. Included in the bulletin is the news that the company has appointed two new senior members of staff, along with an increased number of technical staff. 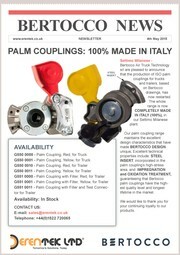 Bertocco is also expanding its business within Europe, the Middle East, East Asia and South America. The company has also recently introduced a new logo, intended to reflect the company ethos of quality and traditional core products. Click on the image to the right to view document. As of 9th March 2015, the maximum vehicle combination weight will be increased from 24.39 tonnes (24 tons) to 31 tonnes. The existing trailer limit of 18.29 tonnes (18 tons) remains unchanged. Also as of 9th March 2015, the maximum speed of vehicles currently limited to 20 mph (assumed to be those with limited braking efficiency and/or a lack of an effective suspension) will be raised to 40 kph, approximately 25 mph. The government is also looking into future increases in weight and speed, and a roadworthiness test (similar to an MOT) for all agricultural vehicles. a) when operating on a single carriageway outside of built-up areas, will have their speed limit raised from the current limit of 40 mph to 50 mph. b) when operating on a ‘non-motorway’ dual carriageway, will have their speed limit raised from the current limit of 50 mph to 60 mph. 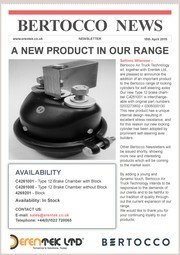 Enables a tractor with hydraulic brakes to tow a trailer with air brakes. 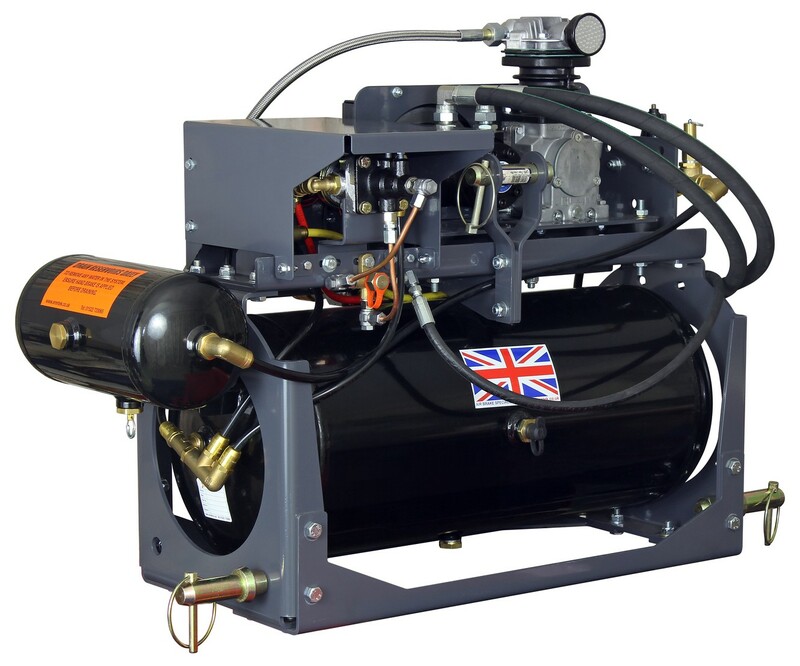 A self-contained air compressor unit for mounting on the three-point linkage of an agricultural tractor and designed to enable a tractor with hydraulic brakes to tow a trailer with air brakes. Everything necessary to provide the driver with full control of the trailer's air brakes is built into the unit, which is connected to the tractor by three hydraulic hoses and an electrical cable. 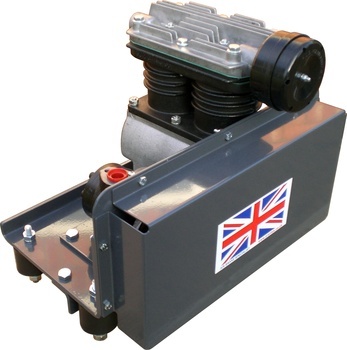 The unit incorporates two self-sealing trailer air brake couplings, plus a quick-release airline coupling and a pressure gauge with low-pressure warning light. 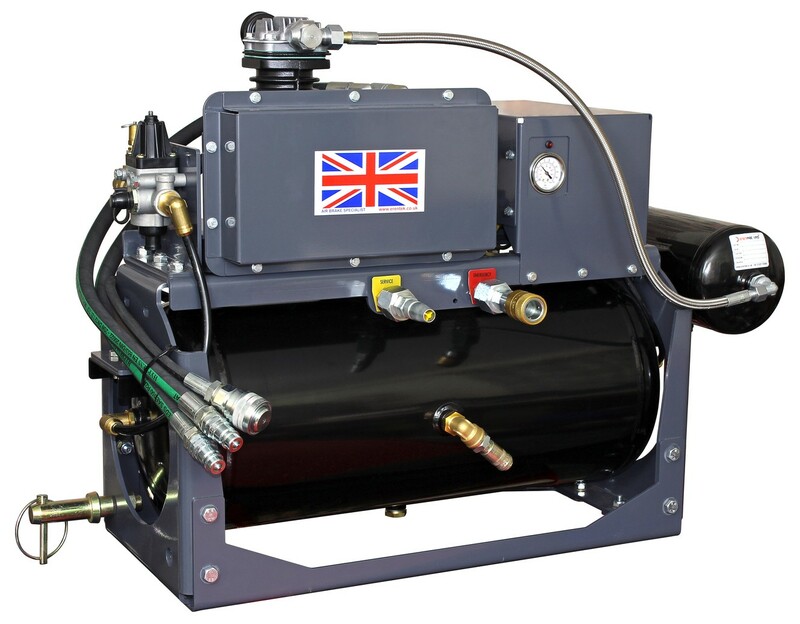 Air for the trailer brakes is generated by the single-cylinder air compressor which is driven by an hydraulic motor. The motor is powered by the tractor's hydraulic pump and is connected to the tractor by two of the hoses. system. A safety valve is also fitted. 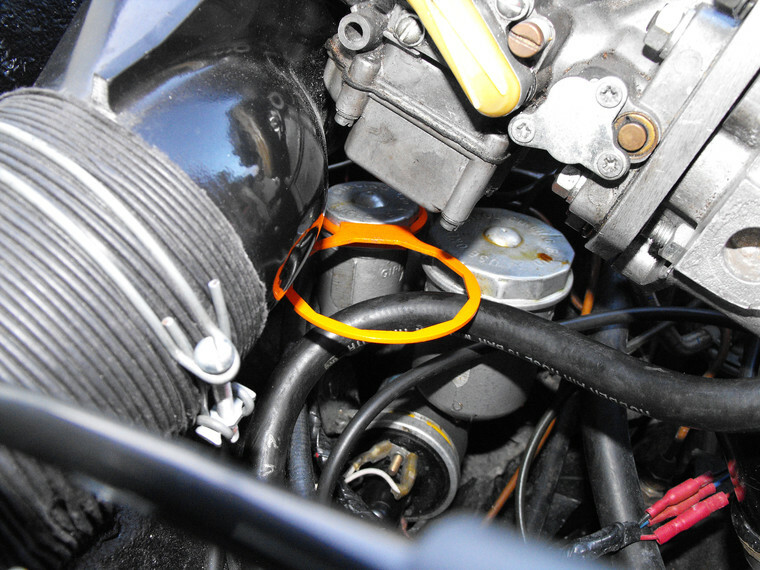 The third hose is connected to the tractor's hydraulic trailer brake coupling, so that whenever the tractor's brakes are applied a valve on the unit actuates the trailer's air brakes. The system has been designed to provide balanced braking on the trailer to match the effort being applied to the tractor brakes. 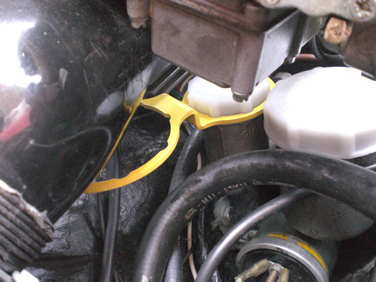 A specially-designed detachable wiring loom connects the unit to the tractor. 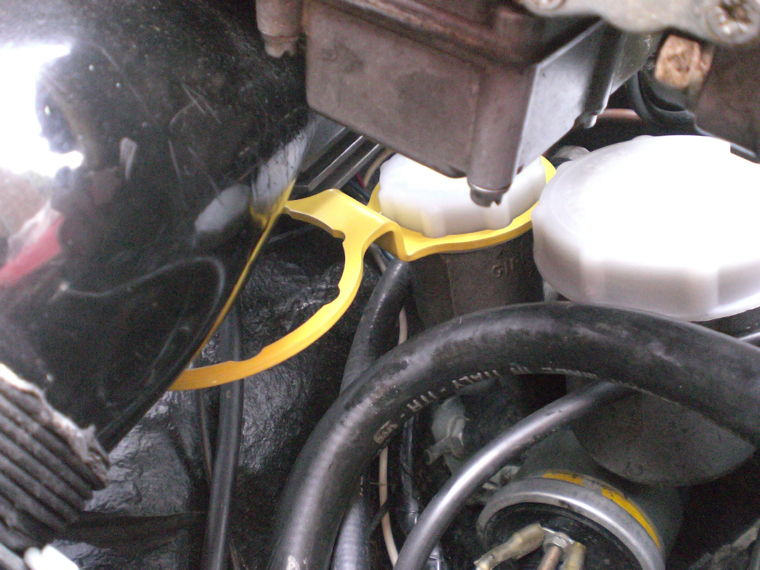 One end of the loom plugs into a 3-pin electrical socket fitted to the unit, and the other end is fed into the tractor's cab and plugged into the 12-volt auxiliary socket. The loom incorporates an emergency trailer brake button which can be mounted in a convenient location for the driver to operate when necessary. We build these units to order and would be happy to discuss your requirements. 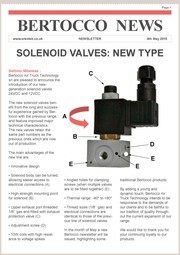 Please contact our technical department for more information. 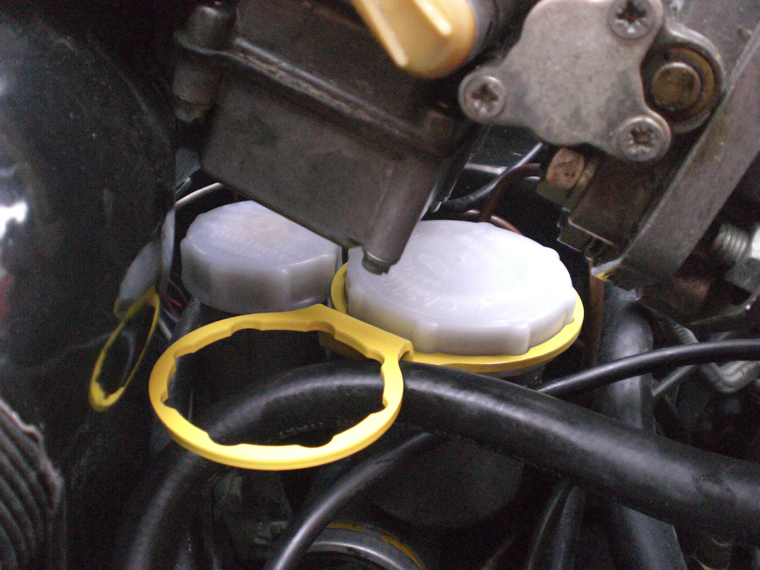 Manufactured by Goodyear, these suspension air bags will replace the units fitted to certain Honda Gold Wing trikes. Maximum Diameter of Air Bag at 100 psi: 3.25"
Competitively-priced. Please contact us for more details. For removing the metal caps on 1 3/4" & 2 1/2" Girling master cylinders without damage. 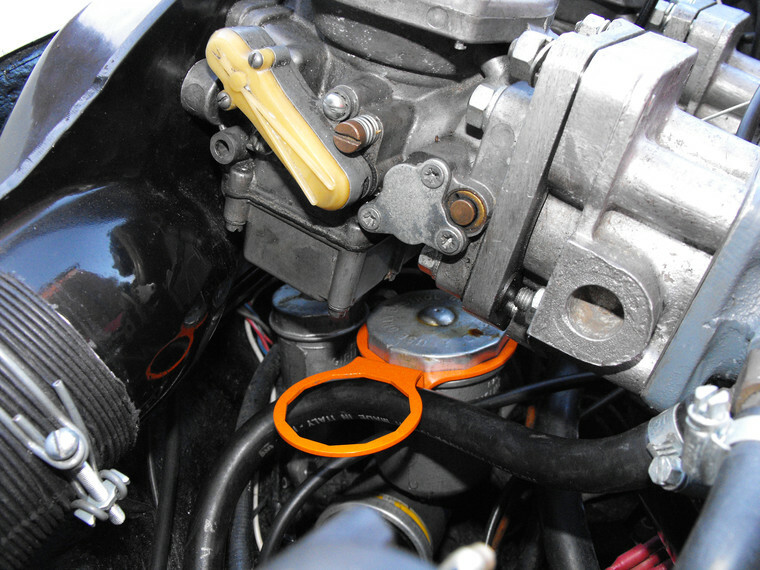 Designed for LOTUS ELAN and other classic cars with Girling master cylinders. For removing the plastic caps on 1 3/4" & 2 1/2" Girling master cylinders without damage. Brand new 12 volt headlamp units to fit all Ducati Monster models with traditional circular headlamp assembly. Now discontinued by Bosch, these units are built to UK specification (left-hand dipped beam) with a metal shell, and are supplied complete with main bulb, pilot bulb, cable and plug, ready to fit.